When I cut into a cabbage, I think of Shrek. Sure, cabbage is green, like Shrek. Sometimes a cabbage caterpillar might crawl out, like Shrek. But really, it’s the layers. Shrek’s speech about onions and layers, and ogres. Cabbages have a lot more layers than an onion, or even an ogre. Except a very complicated ogre. Some crops love frost. All of the Brassica family—kale, Brussels sprouts, and cabbage—become sweeter with the onset of freezing weather. This sweet quality is rarely experienced in grocery store brassicas because they are harvested before frost, either because they are from the southern states where it doesn’t freeze, or because the farmers are afraid of freeze damage that would make them appear less-than-perfect at the warehouse. Stores just don’t have personal relationships with farmers that allow for optimal taste and flavor. In a good year, when we get the cabbages planted early, they can be huge by the time we pick them. You might end up with a 10-pounder to play around with. Don’t be shy—make a lot of cabbagey goodness. Cut it into chunks and use a quarter of a head a day. It’s full of good stuff, antioxidants, vitamins A & C, and so much more. Summer cabbages are more delicate than their hardier fall and winter brothers. More water, and faster-growing, they are definitely meant for quick cooking or eating raw. A final note: Savoy Cabbage is the wrinkly, crinkly type. It is typically tastier in cooler weather, so we save it for fall. It has fine flavor, tender texture (almost like Napa), and the leaves are more delicate and damaged easily. 1. Preheat oven to 400°. Brush a rimmed baking sheet with 1 tbsp. olive oil. Place cabbage rounds in a single layer on sheet and brush with 2 tbsp. oil. Season with salt and pepper and sprinkle with seeds, if using. Roast until cabbage is tender and edges are golden, 40-45 minutes. 1. Heat the oil or ghee in a large skilllet over medium-high heat. Add the onions, ginger, and chile pepper; sauté, stirring often, until the onion is brown, 15 to 20 minutes. 2. Stir in the cabbage. Add the coriander, cayenne, and turmeric and mix well. Add the water, reduce the heat to a simmer, cover, and cook for 10 minutes. 3. Add the tomato and salt; stir to combine. Cover and cook until tender, 5 to 10 minutes. Remove the hot chile pepper before serving. 1. Combine the cabbage, carrot, onion, mint, and cilantro in a large bowl. Toss well. 2. Mix the vinegar, peanut oil, rice wine, honey, and sesame oil in a small bowl until well combined. Pour the dressing over the cabbage mixture; toss. Season with salt and pepper to taste. This goes perfectly well with typical barbecue fare as well as Asian food. Try adding some julienned cucumber, or using it as a bed for grilled shrimp or meat. 1. Toss the cabbage and carrots in a large bowl. 2. Mix the mayonnaise, vinegar, honey, and caraway seeds in a small bowl. Pour the dressing over the cabbage and toss to combine. Stir in salt to taste. Chill until ready to serve. 1. Place one of the pie crusts into the bottom of a pie pan, making sure to leave at least 1/2 inch of dough hanging over the edge. Refrigerate both top and bototm crust until ready to use. 3. Heat oil in a large skillet. Add the onion; sauté until tender, about 5 minutes. Stir in the mushrooms, thyme, and lemon jice. Add the cabbage; cook until tender, 15 to 20 minutes. Stir in the cheese and add salt and pepper to taste. 4. Layer half of the cabbage mixture in the piecrust. Add a layer of sliced eggs. Top with remaining cabbage mixture. 5. Moisten the overhanging edge of pie crust with water. Cover the pie with the top crust, sealing the edges with your finers. Bake until crust is browned on top, 30 to 40 minutes. 1. Melt hte butter in a large soup pot. Add the cabbage; cook for 5 minutes, stirring frequently. Add the water, onion, apple, salt, and pepper. Partially cover the pot cook, stirring occasionally, until cabbage is tender, about 15 minutes. 2. Add the wine and the potato if desired; cook, uncovered, for 5 minutes. Serve warm or at room temperature. 1. Put all of the ingredients in a large wood or stainless steel mixing bowl. 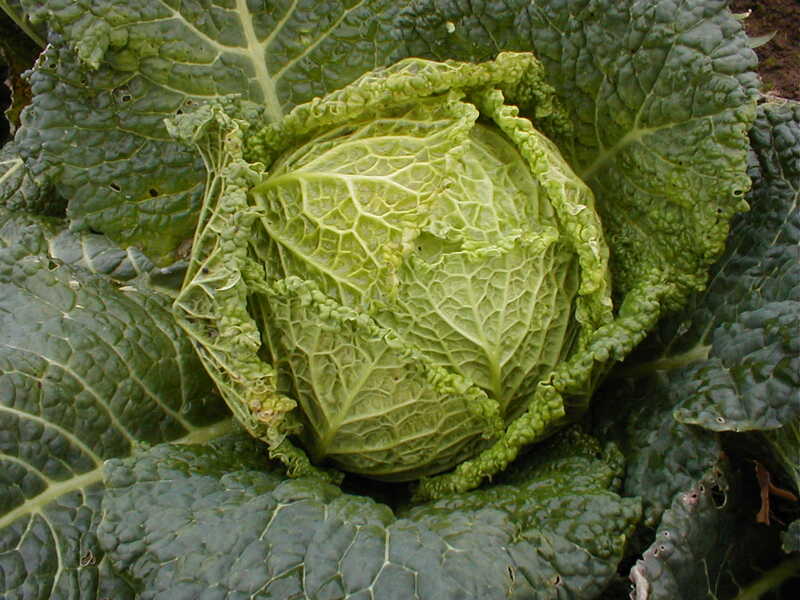 Using a pounder or meat hammer or a can from the pantry, pound hte cabbage in the bowl for a full 10 minutes so that the cabbage starts to release its juices. 2. Transfer the cabbage to 2 clean 1-quart jars, leaving a good inch of head space below the rim of the jar. Screw on the lids. Let stand on the counter for 3 days. By about the second day you’ll notice the lacto-fermentation process taking place—you’ll see bubbles in the jars and the jars will hiss—this is good. 3. The sauerkraut will be ready and will have a wonderful sour, tangy taste after 3 days. The flavor will only get better with age. After the first 3 days, store the jars in a cool, dark cellar or in your refrigerator. This will keep for at least 6 months.